September 6th, 2013 saw a first in football history as the Grenadiers took on South Korea, a new frontier for the world's favorite sport. Played in Seoul, the match saw coach Antonio Israel Blake Cantero replaced by interim coach Pierre Roland Saint-Jean. 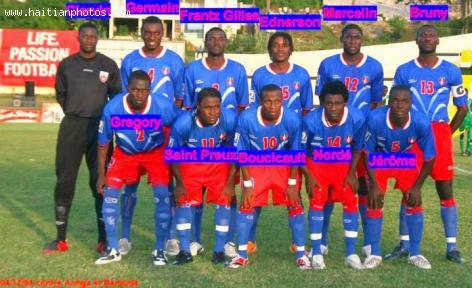 Saint-Jean will coach until a newly appointed coach is selected by the FHF (Haitian Football Federation). Recently placing 74th on the most current ranking from FIFA, the Haitian team looked to best their rivals, coming in at 56 on the same list, in a friendly match to honor their first meet on the green of the Incheon Football Stadium. The game was made possible by the pulling out of the team from Iran, which dropped their scheduled game with South Korea early in the month of August. On the team for the game were the only three teammates playing at a national level, Jean Robert Jean (Valencia CF), Tempête FC's Charles Hérold Junior and Monuma Constant Junior from Racing Club Haïtien. Other members of the team included, goalkeepers: Gabart Fénelon, who plays for FC Saint-Léonard out of Canada and Johnny Placide, coming from RS Reims from France, midfielders: Jeff Louis (AS Nancy/France), Pascal Milien, from Sligo Rover, the Republic of Ireland, defenders: Kim Jaggy (FC Aarau/Switzerland), Kévin Pierre Lafrance of Widzew Lodz, Pologne and Jean Jacques Pierre out of France who plays for SM Caen, and forwards: Sony Nordé from the Bangladeshi Sheik Jamel Danmondi FC, Le Mans, France player Kervens Fils Belfort and Garry Ambroise (AFC Tubize/Belgique). Is it true that Nicolas Duvalier is a Candidate?